Samsung Galaxy S10 has many mobile users fascinated since it was accounced to the public. Compared to previous versions of Samsung devices, it is faster and more stable in speed and configuration. That is why many iPhone users may switch their phones in for the S10. But what do you do to transfer personal data from the iPhone to Samsung S10/S10+/S10e ? After all, these are two different operating systems. It's not easy to transfer data. Don't worry. When you have Mobile Transfer, everything will be solved. To transfer contacts, messages, music, videos, photos, call histories, apps and more from iPhone to new Samsung Galaxy S10 effectively, we need a powerful phone tool to help us in reducing time wasting. This article will provide you a simplified guide on transfer iPhone data to Samsung Galaxy S10. Three easy solutions are enough for you to finish transferring. Syncios Data Transfer is a comprehensive iOS & Android data transferring tool, which allows you to move all you data like messages, contacts, call logs, music, video, etc between iOS & Android devices with great convenience and safety. Backup and restore phone data in lossless quality. Restore iTunes/iCloud backup to iOS or Android device. Transfer iTunes music libaray and playlist to device. 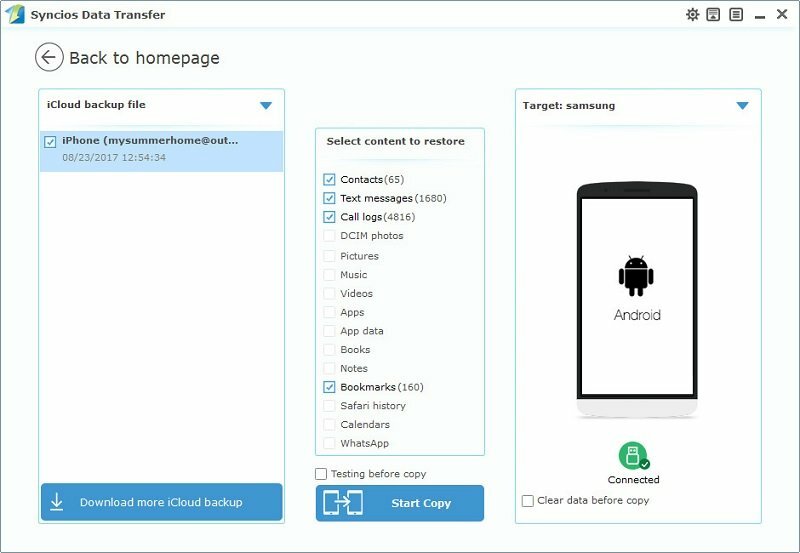 Download and install the compatible version of Syncios Android Transfer on your computer from below, then launch the program. To transfer your data from iPhone to Samsung Galaxy S10, click "Start" button under "Phone to Phone Transfer" section on the homepage. On the next window, you are required to connect both your iPhone and Galaxy S10 (Plus) handset to the computer. Just grab the two included USB cables to do this. Once done, your devices can be detected successfully. Your iPhone should be detected as a Source device and then displayed on the left side of the window, however, the new Samsung Galaxy S10 should be named as the Destination phone being displayed on your right side, otherwise, you can click on "Flip" button to exchange the source and target device. As you can see, many of transferable data types are listed in the middle. Now select the content you would like to copy from the iPhone to Samsung Galaxy S10 by ticking the box next to the data type. It’s worth noting that some options(for example, apps) are grey out for compatible issue between iOS and Android. When you’ve selected the data types that you want to be transferred, click on "Start Copy". The transferring process would be launched automatically and after the transfer progress is done, click "OK" to end it. Please make sure both of your phones's connection are active during the whole process in case of some unknown errors. Now, you can see the iPhone contacts/sms/music and more on new Samsung Galaxy S10. Download the handy tool and follow the steps to transfer data from iPhone to new Samsung Galaxy S10. If you accidently lost or sold your iPhone and urgently need to backup your iPhone data to new Samsung Galaxy S10. Syncios can still help you finish this jpb as long as you have backed up your iPhone to iTunes. To transfer your data from iTunes backup to Samsung Galaxy S10, click "from iTunes Backup" button under "Restore from iTunes" section on the homepage. All your iTunes backup will show on the left list, pick the desired one. Syncios will allow you to restore Contacts, Call logs, Messages, DCIM photos, pictures and Bookmark from iTunes backup to Samsung Galaxy S10. 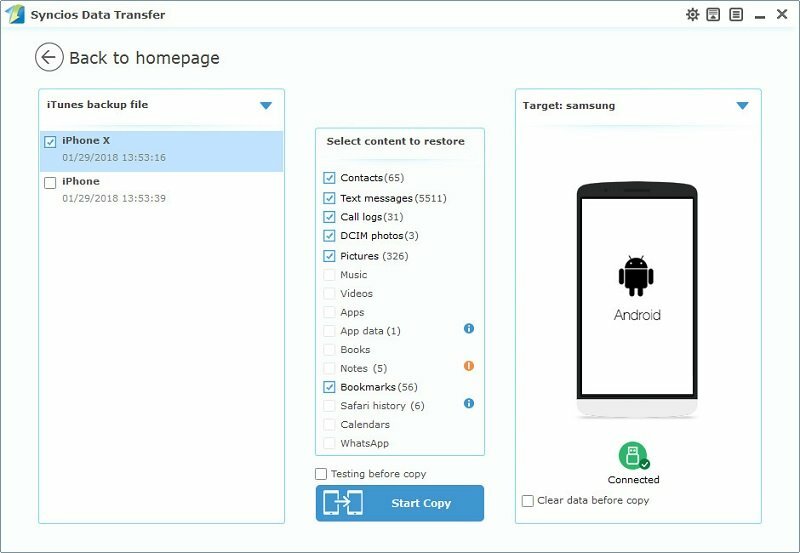 Check the contents and click "Start Copy", your data will soon be transferred to your new Samsung device. 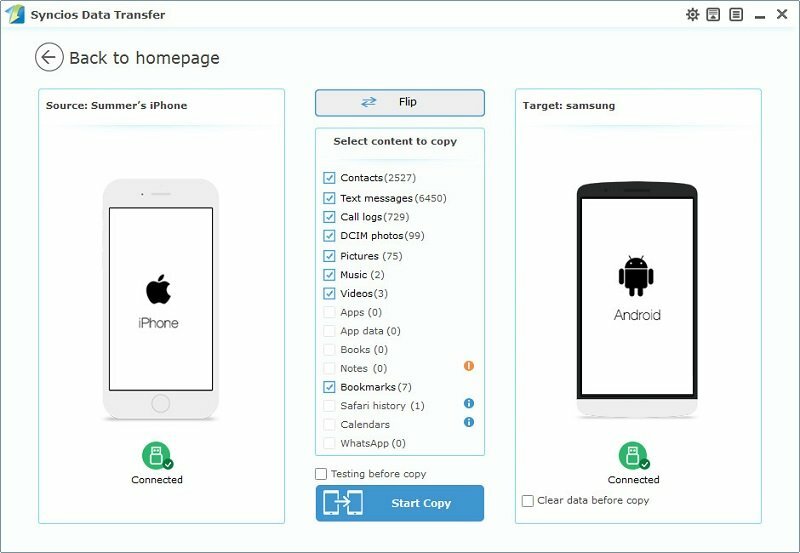 Syncios Mobile Transfer also designed for helping users to restore data from iCloud backup to iOS/Android devices. You can use this program to recover data from iCloud backup to new Samsung Galaxy S10, just follow the steps below. To transfer your data from iCloud backup to Samsung Galaxy S10, click " Restore from iCloud" button on the homepage. Login in your iCloud account, your iCloud backup will show in Syncios, choose the desired one and click "Download". After you have sucessfully download the iCloud backup, double click it to preview the data. Syncios will allow you to restore Contacts, Call logs, Messages, DCIM photos, pictures and Bookmark from iCloud backup to Samsung Galaxy S10. There are many ways to transfer data from iPhone to Samsung Galaxy S10. You may refer to the mentioned tools to do so quickly. If you don’t have a reliable internet connection, Syncios Samsung Transfer is convenient for you because you can still transfer files using a USB cable. Furthermore, Syncios Samsung Transfer will be a good choice if you also want to backup and restore Samsung Galaxy S10. Copyright© 2005-2019 Anvsoft Inc. All Rights Reserved.